Continuous electrophysiological screening of brain activity is essential in order to develop and test novel antiepileptic drugs. Different experimental models allow examining different epileptic syndromes, from focal to widespread activities being initiated across brain regions. Assessing brain activity at high spatial resolution is critical to facilitate identification of seizure onset zone (SOZ) and to evaluate the ability of different pharmacological interventions in controlling epileptiform activities. Recently, we started testing a 32-channels EEG grid developed by NeuroNexus (http://neuronexus.com/), to record scalp EEG activity in murine models of epilepsy (Fig.1). 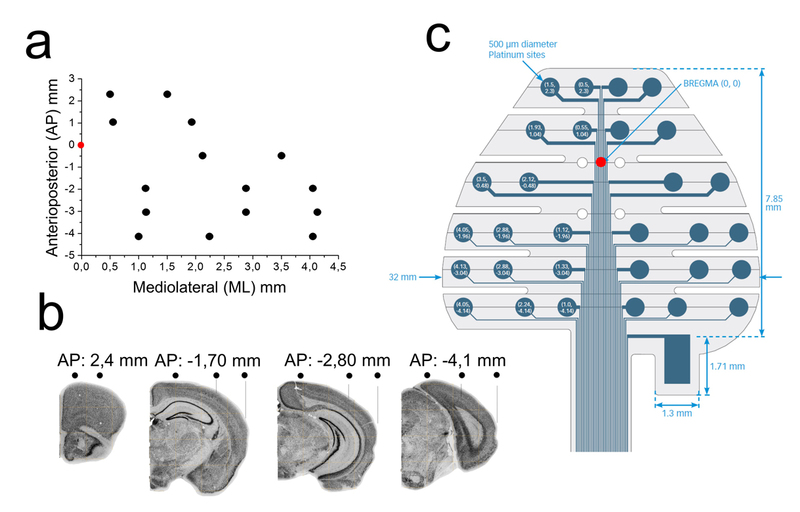 The grid was designed to track the hippocampus from its dorsal to temporal aspects, including the entorhinal cortex, given the relevance of these structures in temporal lobe epilepsy. Thus, contacts were placed at different anteroposterior and mediolateral coordinates with respect to bregma (Fig.1a,b). The electrode layout was distributed along independent fingers that facilitate the grid adherence by surface tension. This design can be easily combined with intracranial probes penetrating in between fingers to evaluate the spread of neuronal activity generators. Implantation of the grid was simple and fast, requiring minimal invasiveness for a subcutaneous placement over the skull. All procedures meet European and national regulations for experimental research and were approved by the ethics committee. Recordings with the multi-site grid were stable over periods of months (up to 3 months were tested without a significant reduction of signal quality). We evaluated EEG activity at different time points over epileptogenesis, to track for electrophysiological changes leading to a chronic epileptic state. During periods free of epileptiform activities, EEG grids allow assessing natural brain rhythms such as exploratory and REM theta (4-12 Hz; Fig.2a). Interestingly, the spatial distribution of theta power in the EEG grid mirrored the location of the most dorsal underlying hippocampus. Over the course of epileptogenesis, seizures and other types of large amplitude interictal discharges were be easily localized with the EEG grid (Fig.2b). These new tools may be useful to study different aspects of seizure dynamics and their control by specific pharmacological interventions, as well as the dynamics of spontaneous and evoked EEG activity. There are comparable solutions in the literature for this purpose, from early attemps using Plexiglas grids (Megevand et al. Neuroimage 2008) to mini-caps for simultaneous EEG and fMRI recordings (Sumiyoshi et al. 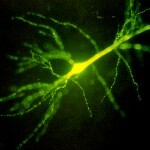 Neuroimage 2011). The group of Jee Hyun Choi already developed a very similar high-resolution EEG grid based on polyimide early in 2010 (Choi et al. J Neurophysiology 2010).